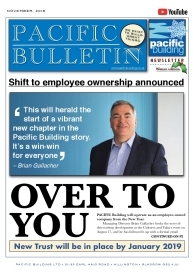 At Pacific, we like to see our name in print, whether it’s in mainstream media outlets or construction news publications and platforms. To date, many of our projects have attracted interest and generated coverage in the national and local press and won us column inches in construction publications – all of which helps to keeps us at the front of people’s minds. With the advent of social and other media forms, however, we can also ensure that we make our own news – through Twitter, Facebook, Google+, Pinterest, Youtube and, of course, our website. Please link up with us wherever you find us – and we will keep you up to date with our activities across the construction and fit-out sectors. And please click on the image below to read our company newsletter.